I read Charlotte Brontë’s Jane Eyre for the first time when I was in high school. At the time, though I enjoyed it, I wasn’t yet reading with the critical mind of an author. I wasn’t reading for craft. The second time I encountered Jane Eyre, I was in university and, having read it before, it was one of the books I set aside from my massive stack of reading. I managed well enough in the course and placed the book on my shelf. Years later, I read the book a second time. Though I was a writer, and published, it was as a poet, and again, I read for enjoyment rather than for craft. Now, I read for craft and I find I mentally dissect books as I read them. I don’t mind knowing the ending, and in fact, I often flip forward in a book. Rather than spoil the reading experience, knowing the climax allows me to see more clearly where the author has foreshadowed events. I can see the structure of a novel like a glowing thread. Here is the hook, the inciting incident, the first major plot point. Reading for craft is more enjoyable for me than reading for pleasure. It’s like daily writing practice. Once you start down the path, it’s hard to stop, and, after a while, you no longer want to. K.M. Weiland and her blog, Helping writers become authors, have been instrumental in my development as a reading writer. You could say I’m a groupie, if there is such a thing. It’s a bit more than being a fan. I share nearly all of Katie’s posts. I want all my writer friends to benefit from her insight and technique. So, of course, when Katie emailed me and asked if I would mind reading and reviewing her upcoming book, Jane Eyre, annotated with an eye to technique I instantly agreed. Onto the review . 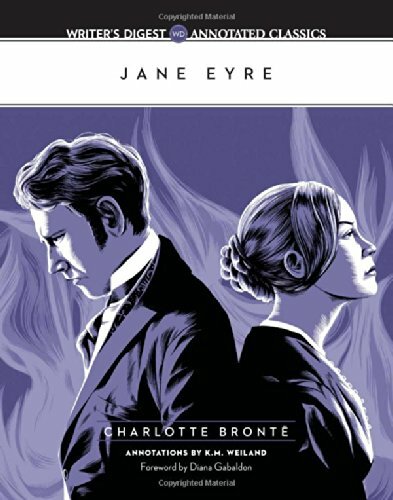 . .
One of the most sweeping and enduring novels in English literature, Charlotte Brontë’s Jane Eyre has become a beloved classic and a must-read for fans of period romance. Filled with memorable characters, witty dialogue, emotional scenes, social commentary, and intriguing twists, Brontë’s novel, written in 1847, still has much to teach writers about crafting exceptional stories. As part of the Writer’s Digest Annotated Classics series, this edition of Jane Eyre features hundreds of insightful annotations from writing instructor and author K.M. Weiland. Explore the craft and technique of Jane Eyre through the lens of a writer, and learn why and how Brontë made the choices she did while writing her iconic novel. The techniques learned from the annotations and accompanying study guide will aid in the crafting of your own celebrated works of fiction. I’ve read Jane Eyre a couple of times, once in high school and once in university, but I’ve never read it as a writer. Weiland’s annotations were an eye-opener. Initially, I considered a couple of what I saw as lapses on Weiland’s part to be creative or editorial decisions, and there is an element of that present. What I was amazed to discover is that Weiland’s annotative decisions are artful, or perhaps I should say crafty, in a way I never expected. Very quickly, her annotations have the effect of tuning the reading writer’s eye to Brontë’s creativity and craft. The reader begins to pick out additional examples of the same techniques as they occur, and may even, as I did, page back through the book to see where Brontë employed the same technique in the past and to what effect. Jane Eyre: Writer’s Digest Annotated Classics is not only a writing craft book, but an instructional manual on how to read critically, as a writer. Under Weiland’s ever-gentle guidance, the reading writer learns that analyzing a text for craft does not have to be a negative experience nor even an academic one. Those of us who suffered through textual dissection in university will be grateful to Weiland for showing us, in the best authorial sense, that analysis can be fun, and even exciting, as our minds race back to our own works-in-progress to apply lessons learned. On that subject, the worksheets in the back are, in my opinion, worth the price of the book. Covering setting, character development, structure, indeed, every aspect of writing a novel, Weiland asks questions, assigns tasks, and refers back to Brontë’s work if we need a little help figuring out how to apply the technique in our writing. K.M. Weiland is the internationally published author of the Amazon bestsellers Outlining Your Novel and Structuring Your Novel, as well as the western A Man Called Outlaw, the medieval epic Behold the Dawn, and the fantasy Dreamlander. When she’s not making things up, she’s busy mentoring other authors through her award-winning blog HelpingWritersBecomeAuthors.com.